Amateur footballers from the local area took part in a charity pitch evening last week and Ferryspeed once again showed its support by sponsoring the event for the fourth year in a row. The event, which took place at Fratton Park on 19 May raised £7250 for Cardiac Risk in the Young (CRY). Steve Reading of Skyline Design Services, which has a long-term reciprocal relationship with Ferryspeed, lost his son Ed 10 years ago while playing football. Ed’s brother Sean set up a five-a-side league, called League Edstreme, in his memory which began life with six teams totalling 48 players. There are now 24 seven-a-side teams with 200 players. This was the fourth charity pitch day organised by Sean and his friend Phil George to raise funds for CRY, the condition that Ed unknowingly suffered from. In combination with other fundraising events organised by League Edstreme, a total of around £25,000 has been raised for the charity. Last year the event was held at Stadium MK and raised around £2000. In 2015, the pitch day took place at Madjeski Stadium, raising over £6000. The first ever pitch day in 2014, held at Fratton Park, raised almost £4000. Sean said, “It’s great that Ferryspeed backed our event yet again and their ongoing support is very much appreciated. “2017’s event was poignant as it’s a decade since my brother Ed passed away. This year was our largest and most successful pitch event yet, breaking all our records with 250 people attending. 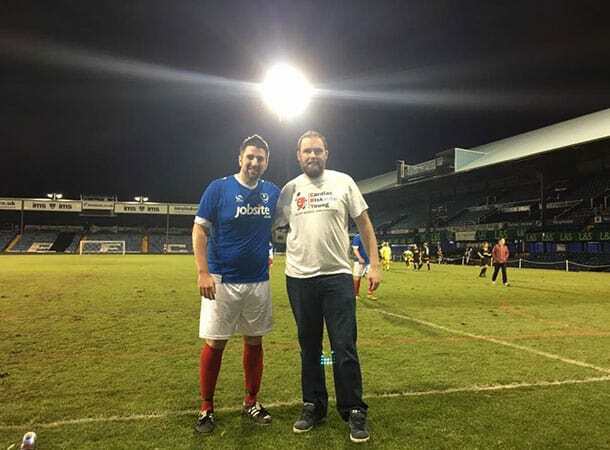 But the best part for me is that we went back to Fratton Park; Portsmouth is where we started playing football and as we’re all Pompey fans, it was a special evening,” added Sean.